Welcome to the Celadon topic, please show and then tell! 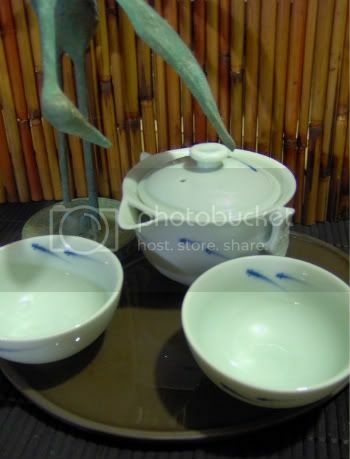 Here is a Taiwanese celadon set, the look and feel is amazing, just a beautiful set to look at and use. Not sure if Mr. Crane is taking a closer look at the fish for lunch or the celadon. This is a new set, less than 2 years old and is used mostly for Chinese greens, oolong and some pu-erh. This will be a perennial reference topic encompassing celadon glazed teaware pieces (or other) from around the globe. Also it will hopefully be a topic where we can all learn about a somewhat confusing topic, "what is and what is not celadon?" To be honest, I am pretty clueless. When posting a photo, include (when available) approximate age, kiln/origin, artisan, how you use the piece, and any other relevant info. Late Ming Dynasty (1600s) true Longquan Celadon plate. Demonstrates clay base and natural crackling in the glaze from use. Cracks are transparent, not deeply colored! 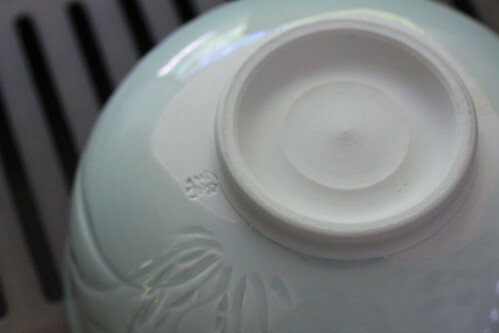 The black dots for the most part are not kiln ash like we see on Yixing or Qing Hua, I believe them to be a reaction from the high iron content in the glaze. 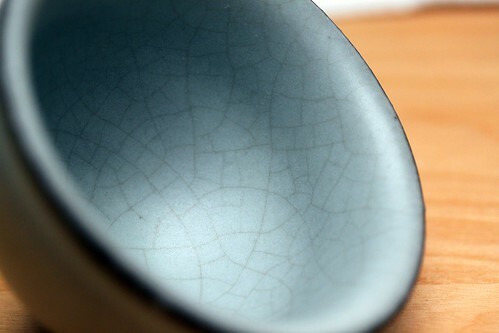 Modern Taiwanese inheritors of Celadon traditions sometimes complain about the difficulty of bonding an iron rich glaze to an iron rich clay, and sometimes play it up to add interest to a piece with a random pattern of black dots. You notice in the foot of this modern reference you see a lighter base clay. Again the lower iron content makes it easier for the glaze to bond. The potter in question will also use a deeply colored Japanese clay as the base, but this leads to many unsaleable pieces and is more costly to produce. Last edited by brandon on Dec 10th 10 4:24 pm, edited 1 time in total. So the story goes that after 1600, the knowledge of Longquan Celadon was lost to time. 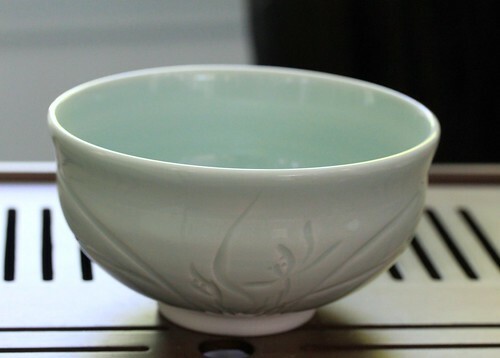 In a popular retelling, a Japanese man of some import had a prized tea bowl of Celadon, and when it broke, he sent it back to China to seek repair. He was told that no one was able to recreate such a piece. This may all be myth, but you can see that Qing dynasty attempts to recreate the glaze are quite different from our first example. These cups are quite damaged, but the crackling effect is barely present. Also, the base here now looks more like products of Jing de Jhen. For completeness... it is currently quite popular in Taiwan to try to reverse engineer or reimagine Celadon. This cup is matte unlike our reference, but still quite lovely. If someone produces a better reference (from their collection that we can closely examine, not an auction site) it should replace mine. The "roots" for this whole celadon idea came to the potters from the earliest wood fired work, before the deliberate application of formulated glazes. Wood ash when combined with clay and fired over about 1200C will produce a glass. This is the genesis of the "shizenyu" on early wood fired work, a natural ash glaze deposit. On clays that contained iron, which most do, this ash glaze tended to disolve some iron out of the clay body .... often coloring it to a celadon green. The celadon glaze gains it's unique jade-like color from a very small percentage of iron oxide included in the glaze batch formulation. In the earliest deliberately glazed work this iron likely was introduced into the mixture as an impurity in the clay material that was a standard ingredient in early feldspathic and wood ash based glazes. Most clays contain a bit of iron oxide that is picked up in the weathering process as the clay is created out of the granitic parent rock and transported by water and wind. When fired in an oxygen starved atmosphere at exactly the correct time in the kiln, the iron oxide changes state, losing oxygen atoms to the cabon monoxide circulating in the kiln. This changes the iron oxide away from its typical reddish coloration. The chemist's term for this process is called "reduction"... the removing of oxygen from a compound. Early solid fuel kilns had very inefficient firebox designs, and because of this tended to produce reducing conditions inherently, so the discovery of this effect on iron should have been only a matter of time. Controling the precise tone of the glaze certainly involved more experimentation on the part of the potters. The balance of the exact chemistry of the glass can impact the color rendition of the glaze from an icy blue to a deep grey green. This other chemistry also impacts the surface qualities of the glass....... high gloss or satin. The timing and intensity of the reducing atmosphere also affects color development. Too complicated to go into here . 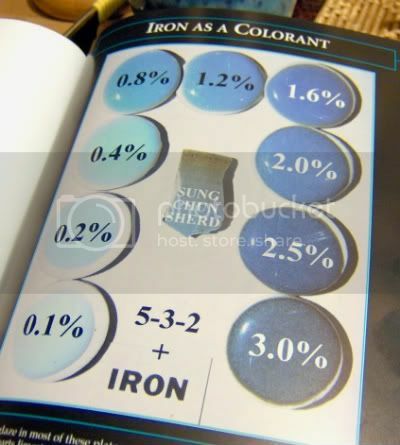 The amount of iron present also impacts the color. The percentage of iron oxide in celadons is typically about 1/2 percent to 3 1/2 percent of the total glaze batch. When the iron gets up into the 4 to 7 percent range, the same glaze batch glaze will go to what the Japanese call an "Ame"....or "candy". That is sort of a clear caramel looking color. And as you get into the 7 - 10 percent range you get the tenmoku and iron percipitate reds (depending again on the chemistry of the base glass). Art historians often classify certain pieces as "yellow celadon". Yellow celadon is exactly the same glaze as green or blue celadon. If is just fired in oxidation. The question I always have when I see this labeling is was this a deliberate effect the potters were trying to achieve? Or was this a piece that when unloading the kiln the potter said, "Darn, didn't get the firing right again!" I'll see if I can get a couple of pictures of my Sung celadon pieces up here. Thank you for that John. I learned a lot. Have you every thought about making a book? I would certainly be interested in one if you did. IPT wrote: Thank you for that John. I learned a lot. Have you every thought about making a book? I would certainly be interested in one if you did. Thank you for sharing photos and comments auhckw and Brandon! Very cool to see something quite old. And another vote ... thank you John. And in the center are pages of tabs showing what different elements, etc. will do to celadon ... iron (as John was discussing) is the first one. 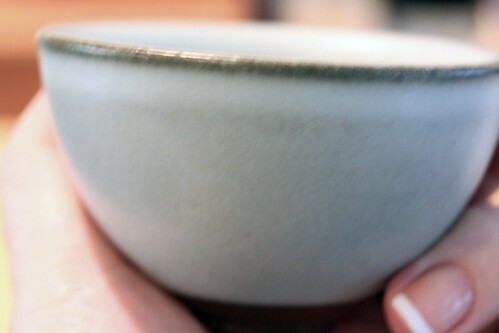 This cup is "Chin Tzi" celadon made by Taiwan artist Xu De-Jia. It is about a year old, purchased from Hou De. Sorry for the blurry image! But with repeated use this cup still shows no sign of crackle on the outside. The walls are very thick. That's a good book on the subject, Chip. We'll make a potter out of you yet. Actually, since you mention it...... turns out I am very busy with the manuscript for a book at the moment....... but it is not on celadons. Sorry. One at a time is enough. Is this celadon? I don't know. It was described as a celadon chawan, but that may have only been referring to the color - being of celadon color. I see a lot of descriptions that really only mean celadon color. 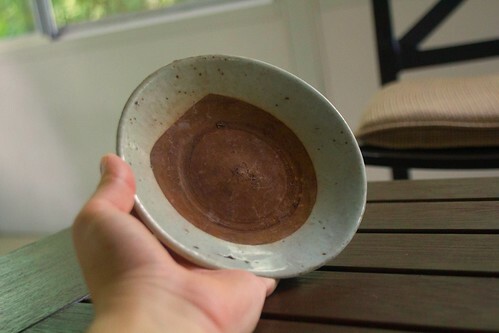 This bowl was purchased from Rikyu within the last two years, but I believe it to be older. Thank you Victoria for sharing your celadon. 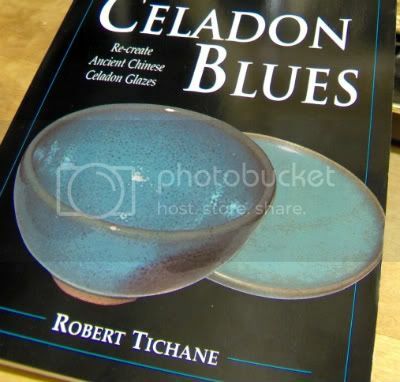 I am hoping we can learn when a celadon piece is and is not a celadon piece. There seems to be more than one definition, especially from vendors. JBaymore wrote: That's a good book on the subject, Chip. We'll make a potter out of you yet. Maybe I missed my calling? Glad to hear that this is a good source of information.